Summary: A sophisticated page-turner about a wealthy New York family embroiled in a financial scandal with cataclysmic consequences. I am a pretty big fan of the Pamela Dorman imprint, so it probably goes without saying that I was very excited to receive THE DARLINGS by Cristina Alger. Ms. Dorman's books never seem to disappoint and I always know I'm in for some quality writing. THE DARLINGS was no exception. This fast-paced novel tells the story of a very wealthy New York family that finds themselves caught up in a huge financial scandal (think Bernie Madoff proportions) and the fallout associated with it. After I read the first 50 or so pages of THE DARLINGS, I was pretty sure that I was going to love this novel. I could see that the author had an insider's view into high society as well as the financial world, and I thought she did a remarkable job of bringing both the setting and the characters to life. I continued to read and enjoy this book, and if I'm being entirely honest, I didn't want to put it down; however, I'm not sure that I'd go so far as to say that I loved it. I appreciated THE DARLINGS and I enjoyed it a great deal, but I don't think it will go down as one of my top reads of 2012. Having said that, THE DARLINGS is a very good book and there are many excellent things about it. First and foremost, I thought the author did a wonderful job in creating and developing realistic characters. While this novel was about the 2008 financial crisis and the events leading up to it, the book focused on the characters and their motivations. Despite being a finance major in college, I don't enjoy reading about all the details that went into the 2008 financial crisis; and I thought the author gave just enough historical information to allow the reader to understand it without getting bogged down. She wisely chose, instead, to focus on how the various characters each dealt with the pending crisis. And what a special cast of characters lived within the pages of THE DARLINGS. I was fascinated by so many of them, and I actually thought each and every one seemed as if they could really exist. What I found unique about reading this novel is that I was interested in what happened to each one. That's not to say that I necessarily liked every character because there were some that just oozed greed, but I was riveted to the book, nonetheless, to see their behavior as well as the consequences. I found it intriguing to see how certain individuals chose to play the blame game, while others followed their hearts no matter how difficult it would prove to be. Another thing I really enjoyed about THE DARLINGS was the writing of the novel. I've already mentioned just how fantastic I thought the character development was, but I was also very impressed with Ms. Alger's writing style. I thought her prose and the dialogue was very polished, and I loved the pacing of the story. The book starts out with a bit of a mystery which definitely piqued my interest. And then the rest of the novel unfolded at an extremely fast pace. In fact, most of the story took place within just a few days. THE DARLINGS is a very intriguing book about how a crisis can affect a family who seemingly has it all. I definitely recommend it for fans of literary fiction. 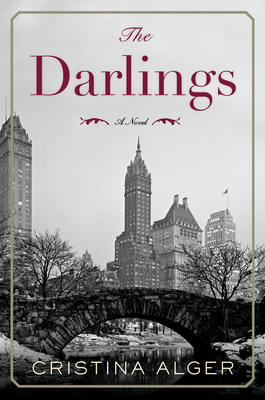 Giveaway alert: I have a copy of THE DARLINGS to share with one lucky reader. To enter, just fill out the form below before March 7th at 11:59 p.m. ET. This contest is open to those of you with U.S. and Canada mailing addresses only. Good luck! This sounds like a story ripped from the headlines! I love the Pamela Dorman imprint too. This is the type of book that would probably give me insight into all the financial crap that has been going on for the last handful of years. It is my husband's favorite topic (ugh) so he might even be interested in reading it. I don't think I've read any Pamela Dorman imprints yet...going to have to look into it. I always enjoy books that offer a peek into NY high society. Even thought I live in the same city, it really is another world.